Many users like to use the Quick Launch bar to make the access to frequently used programs easier, faster and more direct. For instance, users can add in Microsoft Outlook into the Quick Launch bar and make the access to the program much easier by just clicking on it. 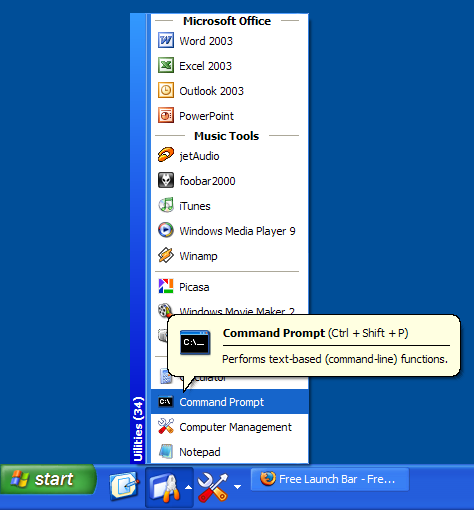 The Quick Launch Bar might be useful but if you are a heavy user of the computer and there are many shortcuts needed to be added to your Quick Launch bar, it will become crowded and look messy. To overcome the limited space problem, you can try Free Launch Bar, a free replacement for the standard Quick Launch Bar which can group your applications to appear as in a pop up for easy viewing. To display the Quick Launch Bar, just right click an empty area on the taskbar and click Properties. On the Taskbar tab, under Taskbar appearance, select the Show Quick Launch check box and click OK.
Once the Quick Launch Bar is displayed, users can just drag the icon of the selected applications into it in order to create a shortcut. Free Launch Bar is available free to combine your shortcuts into groups. For instance, you can combine your IE and Firefox under one group, say Browser. Click on “Browser” and there is a popup menu showing IE and Firefox. You can launch your IE or Firefox very much faster. • Improved tips. You can include some of HTML tags into button description. Download link for Free Launch Bar.